Introducing our new boxed lunch menu for a fresh, fast lunch! 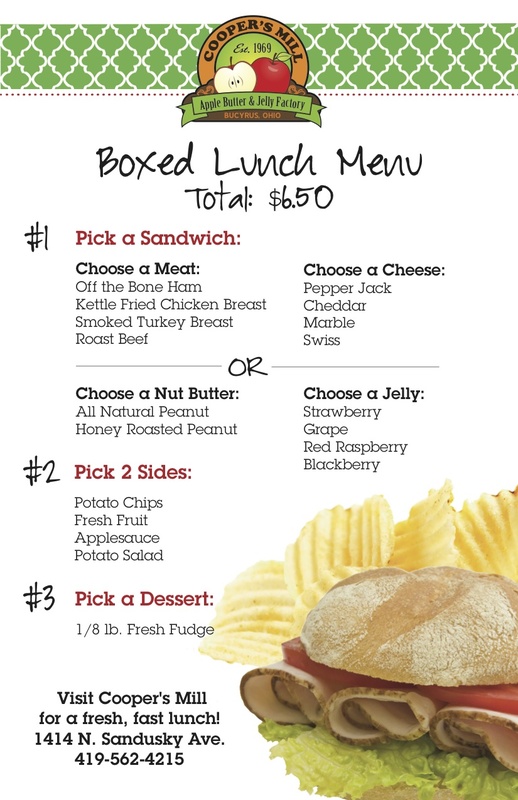 Check out our new boxed lunch menu for a fresh, fast lunch! Includes: meat and cheese or peanut butter and jelly sandwich, 2 sides, and 1/8 lb. of fresh fudge for $6.50! Also available in large orders for businesses! Stop in or call ahead to order 419-562-4215! This entry was posted in Uncategorized and tagged businesses, Coopersmill, fast, fresh, fudge, lunch. Bookmark the permalink. ← FRESH VINE-RIPENED TENNESSEE TOMATOES AVAILABLE THIS WEEKEND!